—-Chat with me about important women’s topics on vProud! I love that outfit you were wearing in the photo shoot on the last day. As always you look beautiful! Love that LA lippie. SO COOL! When can we see the pictures? Can.t wait!!! I love Goodwill. You never know what interesting things you will find there. You and your Mom look so much alike. She seems like a fun Mom. Loved this! You look stunning, as always. And does Ruby speak Spanish? Because I saw that her black sweater has Spanish writing. xD Ps: your mom is so lovely and cute! Oh darn I totally wish you would’ve done a meet up while you were in Pittsburgh I also live in Pittsburgh mod cloth is something that I am super proud of because it’s Pittsburgh born! It will be so awesome to see you all over their website modeling yeah hey! No Pittsburgh is not known for its hotdog sadly I wish we had some better hotdog places here thought we are known for lots of good food but mostly for the permantis Sam wage which is totally awesome and lots and lots of other good Polish and Italian kids! your in my city! ahhhhh i wish i could i seen you! Why would anyone dislike this video? Lol weinies.. Your gorgeous! I hope that makeup tutorial comes out before Saturday night! I have a wedding to go to and it’d be PERFECT! omg, you are so beautiful. I found you on youtube few days ago and I am refreshing your channel few times a day, hoping for any new video! I am so in love with your channel, every single minute makes me more confident about myself. Thats so cool that there are people like you, trying to help others, to make them more confident about themselves. Thank you for that. Maybe that’s lame what I just said but I thought you should know that there are people who are really thankful for what you are doing. 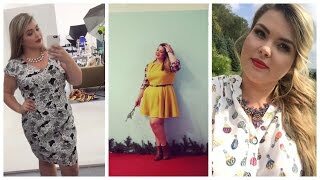 It is a little thing but changes a lot to most plus size women that follow your channel. I wish to say more but my english isn’t that good to express all I feel right now. What I can say more? Keep going girl, you are doing great job. Btw, I hope for more videos about dresses! Your glasses are gorgeous, they really suit you. Ruby reminds me of Michelle Phan. Loving your videos! Thank you. First time I have been smiling in a LONG time. I simply must know where you got the cardigan you’re wearing after the 2nd day of shooting. The first day of your sunburn. It is so light and pretty. Keep up the amazing work you are doing! You are awesome! I looked 4 that lip color @ Cvs & couldn’t fine it…. I need /want it!!!!! ohmigawd that selfie case with the light!!! Oh that is so cool you were in my state. I love the clothes I am going to check out their site. I did want to ask your opinion on what makeups are best for darker skinned women? What? Where did you get a selfie photo case from? I want one!!! What!! You were in Pittsburgh ?!?!? Your mom is so cute and funny! Love your sweater you wore the second night! How is there a layover between Boston and PA? You can drive those in like five hours! Lovely Vlog so happy to have found you. My head is spinning w all the makeups. Not sure if you have a vlog on budget friendly ones. This single mom needs a bit of revamping my style, Please help…. where did you get that cute green jacket ?! LOL! My son loves Annoying Orange! Omg I live in Pittsburgh I wish I could have met you! Omg! Do you live in Pittsburgh?! I’m from there! Shout out to the middle age lady wit short hair and nice glasses. ..I feel you girl….you guys are sooo cute! smooches darlings!! I live near Pittsburgh 😺😺😺😺😺😺😺😺!!!!! Was the popcorn place in Wexford? I live ten minutes away from Pittsburgh! Aw I live 20 minutes from Pittsburgh! And Pittsburgh is known for Primantis and pierogies. Your mom is SOOOO funny! !